The brand domain is the part of a domain between the subdomain and the top-level domain. If you rebrand your company, or your company is acquired, you can replace your brand domain in the domain manager to update your hosted content. With the brand domain add-on, Marketing Hub Enterprise users can host and manage content for two or more distinct brands. What happens when I replace a brand domain? 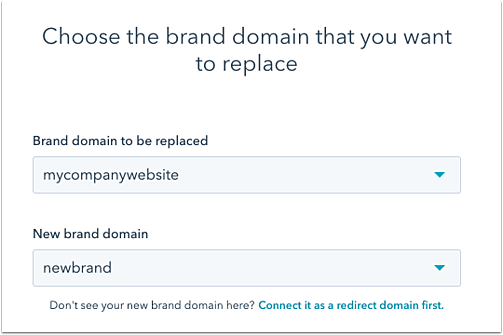 When you replace your brand domain, all primary and secondary subdomains connected in your account will update to include the new brand domain in between the subdomain and the top-level domain. For example, if you replace the brand domain "hubspot" with "inbound", www.hubspot.com and blog.hubspot.com will update to www.inbound.com and blog.inbound.com in the domain manager. Please note: you need to connect all of your new brand domain's subdomains as redirect domains before replacing the brand domain. If you don't update your DNS records before replacing your brand domain, content published to these domains will not be live. The content will still exist in your account, but it will not be accessible to your website visitors. Once the brand domain is replaced, your existing content will move to the new brand domain's connected subdomains. Any custom analytics views created using the old brand domain will be deleted from your account. How do I replace my brand domain? At the bottom of the domain manager, click to expand your Advanced options. On the next screen, click the Brand domain to be replaced dropdown menu and select a brand domain. Click the New brand domain dropdown menu and select the new brand domain. Please note: if you haven't connected the new brand domain as a redirecting domain, you will not see it listed in the dropdown menu. On the next screen, click Connect domain for any new domains that are not connected. Once your new domains are connected, click Replace brand domain. If you are waiting for the DNS changes to propagate, or you don't want to connect these domains even though this content will no longer be publicly accessible, select the checkbox in the alert before clicking Replace brand domain. If you are an Marketing Hub Enterprise user and you're managing content or reporting for more than one brand in your HubSpot account, learn more about purchasing additional brand domains.